These were my blue scraps at the beginning of the month. A big pile of crumbs, a basket full of strips in three sizes and stacks of squares in two sizes. I produced some more scraps as the month went on, primarily from Anna's reach for the stars quilt which just needs borders. The squares are gone and there are a lot less strips. I have two blue projects done start to finish. One is the Blue Sky quilt which has already been gifted and the other is a mug rug that I happily use every day. I've got three projects almost done. 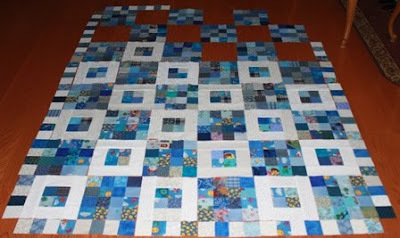 The blue snowballs are waiting for a border of nine patches which have been partially sewn. There is also a place mat for Anna that just needs a border and fusible applique addition. 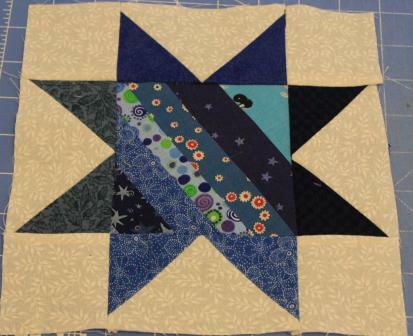 Baby pinwheels are done and layered, I've just been afraid to tackle the quilting for fear of messing it up. 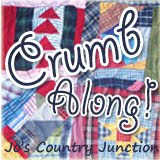 I've still got some blue crumbs to go back into the jar, but most of them are sewn into bigger chunks than they were. I'll hang onto the sampler blocks and let them build slowly as the year goes on. That just leaves the tumblers and the crumb blocks. They might sit for a bit longer as a collection or they might get stacked as leaders and enders. Looking at the collage, I am amazed at how much BLUE I had! I'm glad I got so much used up, but I am also so happy to begin thinking about RED for February. I'll put the mister linky below in case anyone else wants to sum up and share their progress for the month. 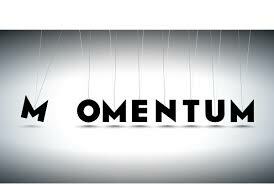 I have been so inspired and motivated by all the great blue projects that have been created or completed this month. Congratulations to everyone who is participating! 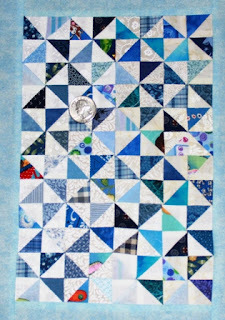 Today is the last day of January and therefore the last of the blue days for my Rainbow Scrap Challenge. I am left with a hodge podge of experiments and ongoing projects. There are three sampler blocks to be put into a rainbow sampler collection along with two sizes of tumblers to be sewn together. 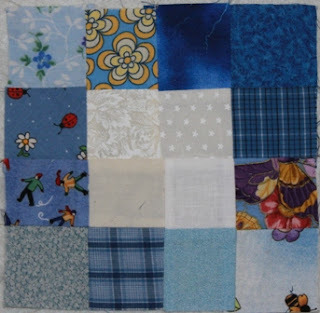 Add to that a diamond block and a few leftovers from the blue sky quilt. The other wall has about 70 4.5 inch crumb blocks. I think I'll save these until I have enough collected for an entire quilt. I might be able to do it all in blue but I might wait until later months to mix in a bit of purple or teal. I guess I could also wait for red and go with the patriotic route...... The possibilities are endless. Saturday was pretty booked this week with the Lego thing and the usual ice skating and trying to finish the sunshine quilt, so I tried to carve out some time on Sunday. DH was kind enough to schedule an OM practice even though he is out of town, so that took up the middle portion of the day. I took my iron out to the garage and pressed some strip sets while the kids worked on their machine. I also did some cleaning in the garage, though it doesn't quite look like it from the photo. The other side is much nicer, you'll just have to take my word for it. After that the kids came with me to take the quilt to the hospital and deliver it to Meg. She enjoyed all the signatures on the back and spent a lot of time reading through them all. 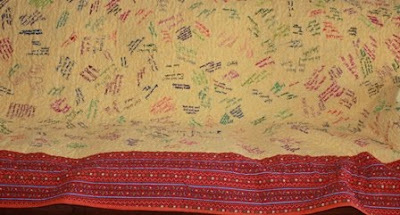 She said that she had never had a quilt before and was quite overwhelmed by having one to keep and enjoy forever. Sydney was nice enough to explain to her that we have lots of quilts all over our house and even a giant one on the wall. Kids are always good for lightening the mood. The kids wanted to stop at a special toy store on the way home to buy some hex bugs with money that they had gotten for Christmas. By then it was almost dinner time, so we dropped by CiCi's pizza along the way. I worked on the ironing again after that and made a startling discovery. 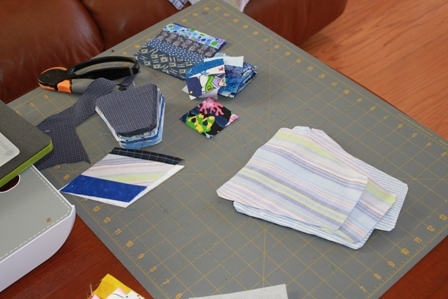 Despite a solid month of sewing steadily at blue scraps and producing several projects in various stages of completion, I seem to have more blue scraps now than I did at the beginning of the month. That isn't really possible, is it? I'll finish off what I can tomorrow and tidy up all the loose ends before getting an after photo. How hilarious would it be to find that my scraps really do multiply in the dark of night? Meg's Ray of Sunshine is officially done. I will deliver it this afternoon after the kids are done with Odyssey of the Mind. They all want to come to the hospital because they think it sounds like fun. I think the last time any of them was at a hopsital was when Sydney was born. I'm sure it seemed like fun then. I'm going to try to come up with another plan for them. I used a pantograph for the quiling, it was called Dandy and I got it in a packet from Golden Threads. 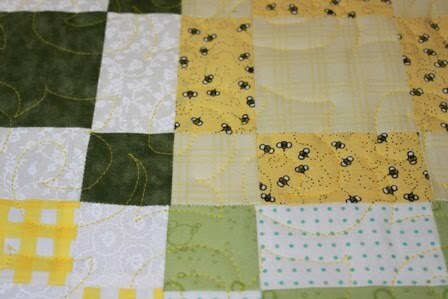 I used yellow thread in the middle and then switched to green for the border and quilted parallel lines on the DSM. I love the way the back turned out with all the signatures. I made Lizzie pose for a photo while I was working on the binding. Meg has owns of her siblings from an earlier litter, so obviously she is a pug person. So now I am off to do the usual Sunday things. Laundry is started and the kitchen is scary. 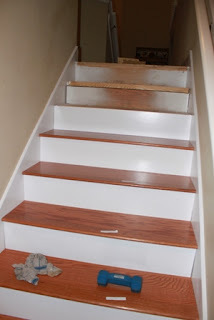 I'm afraid to go upstairs, but down here looks reasonably clean. I've got a test to grade and had better get started on comments for interims. I think they are due on Tuesday. Add OM and a trip to deliver the quilt and I think that will make up the day. Hope all is well out there. I do plan to indulge in a little time today seeing what everyone got done on Scrap Happy Saturday. 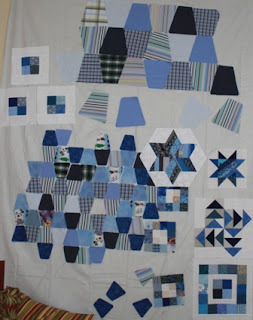 I've still got some blue projects hanging out that I would like to finish off or clean up so I can switch gears and get ready for a new color and a new month! One way to deal with scraps is to choose a shape and start collecting lots of them. 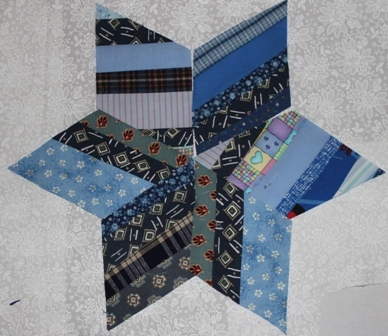 I used to collect shapes for charm quilts, but it was too hard to keep track of which fabrics I had or had not used. 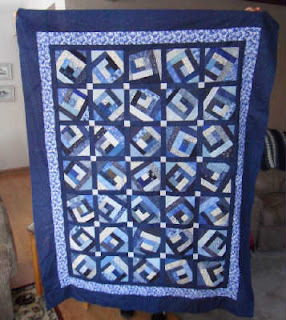 These one block quilts are of the non charming variety, but I like them just as well. I have been cutting old shirts into 6.5 inch tumbler blocks for a while now. Old shirts make the softest and most cuddly of quilts. I just got the small tumbler die and started cutting smaller scraps into these 3.5 inch blocks. Smaller blocks are so much cuter, but it will take lots more of them to make an entire quilt. Maybe these blocks would like to be a place mat or a bag of some sort. I'm not sure how much I'll be able to post today as my computer is going to be at the Lego Tournament again. I've got Ray of Sunshine done to the binding stage and will work on hand stitching that during ice skating this morning. After that, the girls and I will go up and relieve Kurt at the tournament so that he can catch a plane. I'll have lots to post later though and will try to make a nifty month end collage very soon. I hope everyone is having a great weekend so far, I'll try to keep up on my i-pad. 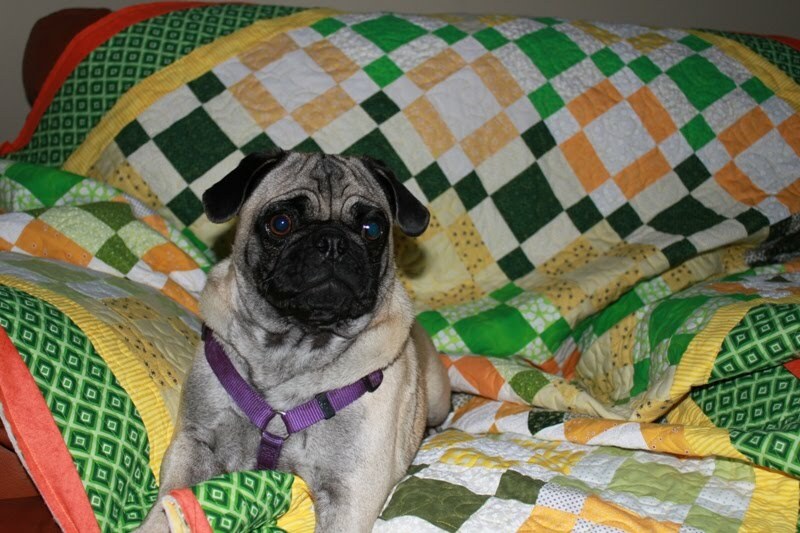 So the quilt is now officially called Meg's Ray of Sunshine. I took it in to school today to collect signatures. Then it was blessed during chapel. Now all I have to do is frame out the back so that it is larger than the front and load it onto the frame. I think I'll use a pantograph that I've done once before. I bought some yellow thread that I think will work well. If I can get the binding on tonight I'll have lots of time tomorrow during ice skating and Legos to sew it down. That's my plan. Wish me luck. It is way too late on a school night, but I wanted to get this top finished up so that I could take it to school tomorrow. I'm going to have the kids sign the back and then get it quilted up and delivered. For now I'd better get to bed though. 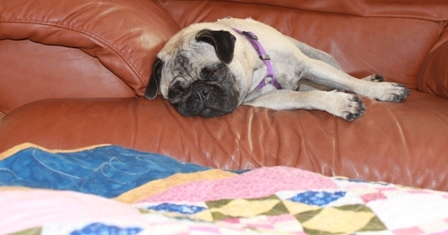 Slowly, slowly the week has been passing with very little quality quilt time. Yesterday we started dog obedience classes. I enjoyed a girls night out and caught up with a girlfriend for dinner. Ryan had his first football practice of the new season. Tuesday we had storms and stayed in to watch the State of the Union. Monday we went out for dinner as a family and then the girls got thier nails done while the boys bought goodies at the sporting goods store. Sunday was Lego practice for the big regional tournament this weekend. Lizzie has been keeping me company while I finish the hand stitching on Double Delight. There are only a few inches left, so I'll find a quiet moment for that soon enough. I've been trying to get the top for Kitty Korner Webbed. I've made arrangements for the kids at school to sign the back before I do the quilting and I'd like to take that in tomorrow so that I can do the quilting on the weekend. The coworker whom it is for is scheduled for surgery on Monday and I would sincerely like to have it to her before then. I'll need to think of a new name though, she is a dog lover. 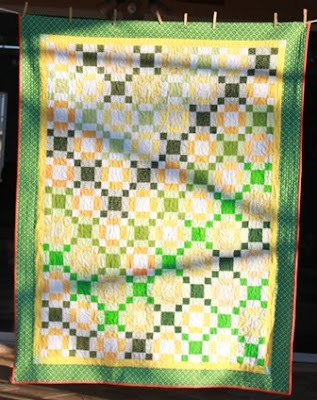 I don't think calling it the green and yellow cancer quilt is such a good idea either. Names are so hard. Maybe something about sunshine or the grass being greener or something somehow cheerful and optimistic.......Any body have some ideas to share? I was thinking that I would have a nice quilty Saturday followed by the usual Sunday routine of cleaning up around the house. I got a call from on old friend on Saturday though and ended up going off on a tangent for the rest of the day. 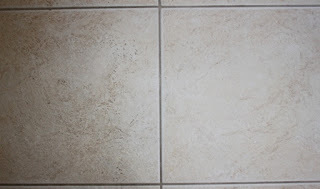 I did spend time this morning finishing up the tile in the entryway. How do you like the before and after photo? I stopped when I got to the hallway so I'll need to do that part at some time in the near future. There were 60 tiles in the entry though, so scrubbing and polishing them one at time took up quite a bit of time. Scrubbing floors is kind of meditative actually so I got to mull things over while I was working. I've got some papers to grade this evening so I had better get started on that. Maybe if I can get caught up on school work tonight I'll have some time during the week to get a little sewing done. It sounds like a plan to me. Post your link here to any of your scraphappy project. We are running out of blue days on the calendar, so try to use up the last of your scraps. This block is a simple 16 patch. The pattern comes from placement of the light and colored squares. 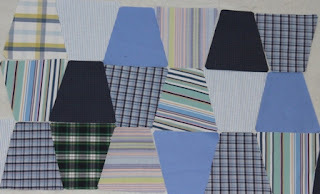 Instead of being put together in a checkerboard pattern, each four patch is put together with three colored blocks and one white block. These are easy to put set up as leaders and enders. Half of your squares get matched with another of the same color and the other half get matched with a white square. We always root for the kids to do well in all their activities. It is nice to see them rewarded when they do well. Somehow every little victory leads to a bigger time commitment though, and we seemed to be a bit short on hours in the day lately. 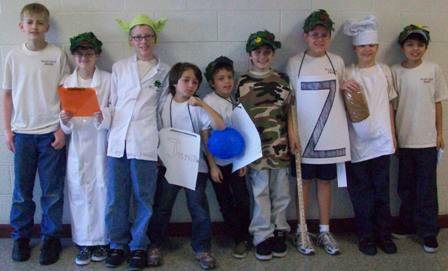 Last weekend Ryan's Lego Robotics team had a tournament and qualified to compete in the regional competition. We had thought we would be done with that before football started again, I guess it won't work out that way. The kids were all so excited though and want to get their robot to complete another challenge before the next round. 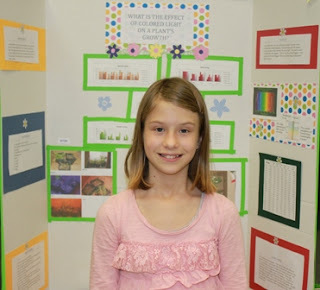 Yesterday was the school science fair competition. I had volunteered to be a judge. I couldn't do any of the categories that my kids were in, but ended up doing some of the other groups. I didn't do the nosy mom thing and stayed away from the area where their projects were. 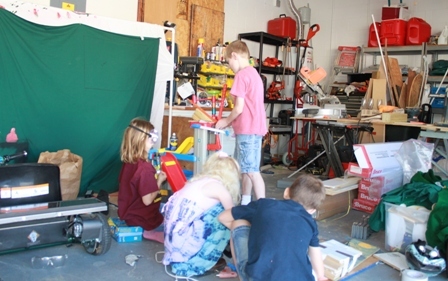 When I went back after school though to get Anna headed off to her Girl Scout field trip and Ryan working on his robot I found out that she had won in her category and qualified to compete at the regional competition. We went to the awards ceremony for that last night though Kurt was late because it was at the same time as the football coaches meeting. It is all good, maybe we just need to start doing some picking and choosing. I'm feeling a little overbooked and stressed, I'm sure some of that is carrying over to them. For now, it is Friday though. A weekend is always good for the stress levels. I had most of the blocks done for the green and yellow quilt when I pulled it out this afternoon. This evening I finished up enough for a 7 x 11 setting. I was going for 7 by 9, but Kurt thought it should be longer. With a 6 inch block, that is 42 by 66 before borders. I'm not sure what I have for a border, but a yellow and green print would be nice I think. I'm still playing with the block arrangement a bit, but I'm going for a general V type of design. I was hoping I wouldn't be making another cancer quilt for a while. I just got news today that a coworker is in the hospital with a mass on her kidney. One of the ribbon colors for kidney cancer is green. 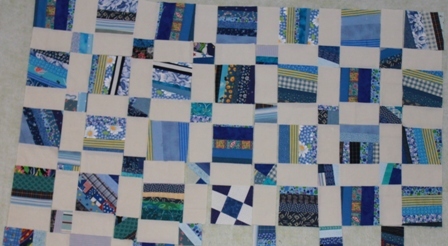 I'm thinking of counting blocks to see how close this one is to being an entire quilt. 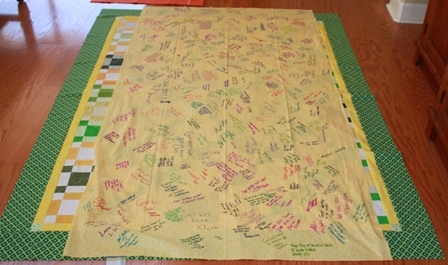 Maybe they will find that the mass is benign and this can just be a get well soon quilt. I hope so. It was at the end of last weekend when my dryer stopped blowing hot air. The washer had been acting funny for a while but hadn't given up the ghost completely yet. The very nice men from Lowe's just left after setting up my brand new high capacity front loaders. Guess what I'll be doing for the rest of the day? I know that there have been a lot of advances in laundry technology since I got mine soon after moving to Florida. I think I'd better read the manual. I'm thinking of making a counter top of sorts to set along the top to use for ironing and folding. Kurt had the kids make me a new PVC hamper to slide under the counter. I just need to make a muslin liner for it and I'll be all set. Susanne at makesharegive sent this photo a blue block that she made for crickets studio quiltalong. It looks like she used some denim in one of those strips and even left the seam in on one block. How fun. I love the artistically arranged photo. I'm doing borders on the moon quilt and have slowed to a glacial speed. I don't know what it is about borders, but it is the point at which I am most likely to get hung up. It is cold and rainy here, I think I'll go make some hot tea and ponder for a while. I had to put up my second design wall. It had been down since the last time we had company. With all the scraphappenings on Saturday though, my walls were running out of space. So on wall number 1 are the crumb and cornerstone blocks. They are squared up with my GO to 4.5 and 2.5 inches with simple white strips between. This is part of wall number 2 is where I have some of the individual blue blocks I have been working on this month. The top block is called Flying Strings, the middle block is Pinwheel Geese and the bottom block is Blocked In from the Quiltmakers 100 block issue. I think it is my favorite blue block so far. I cleverly cropped out the rest of the wall where projects for the next couple of Saturdays are hiding. Just believe me when I say that there are blue projects everywhere. So after all of the fun with scraps, I decided to shift gears to UFOs. This is number 6 on my list. After much time crawling around and measuring, I got all the bits and pieces put together to form the center of the top. I'll need to go check it out on the bed before I figure out what comes next, but maybe a thin yellow border and a wide border of blue squares. 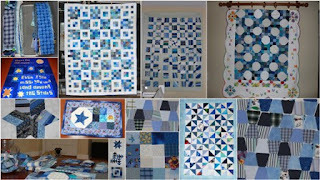 I hope I get to use lots of blue squares, because otherwise I will have made lots of new blue scraps and the month is almost over. I guess scraps never end. This is a finished quilt by Anne P. which was in my e-mail. 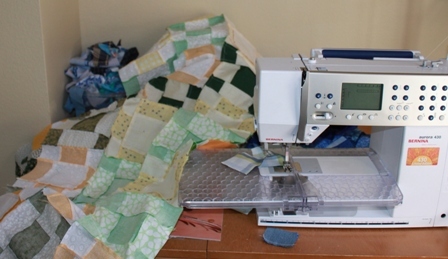 She used the mile a minute method, and is donating to a project for her quilt guild. So many blue quilts are being made. I am excited to see what happens next month. I was going to use the bonus blocks from the snowballs to make a case for my i-pad. Now that I have them together though, I hate to cover them up like that. Maybe I'll just make a tiny little wall hanging instead. The individual half square triangles are squared up to 1.25 inches, so the finished size is .75. I have been having so many participants for the Rainbow Scrap Challenge who are from other countries that I have added a Google translator widget to my sidebar. It is above the button on the right side. I am enjoying reading the blogs from so many different places. If I do three blocks each month that are 12.5 inches, then I will have enough at the end of the year for a queen sized quilt. I'm not sure that I need a queen sized rainbow colored quilt, but I'm working on three a month nonetheless. This one is called Boxed In. 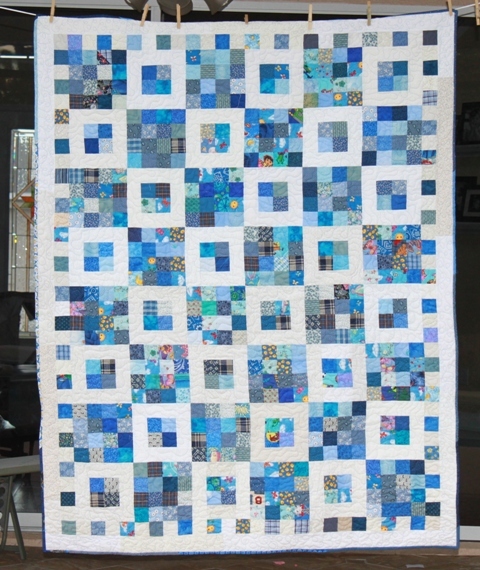 It was designed by Julie Herman at jaybirdquilts, and is block number 171 from the Quiltmaker 100 blocks issue for this year. I bought the first issue last year and never made a single block from it. So I'm already ahead of the game by getting this one done. 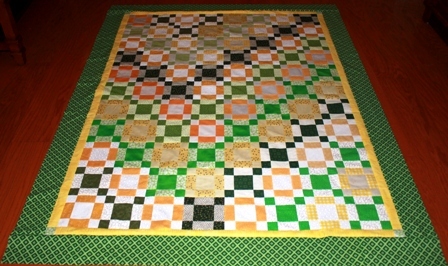 It was super simple to make and just used 2.5 inch squares and 1.5 inch strips. I won't give you all the measurements, since it was a published pattern and all. Isn't it cute? I could see a whole quilt made up of just this block in all different colors. 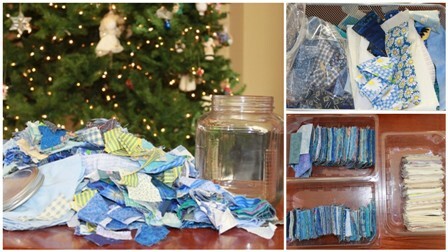 I am amazed at the creativity and productivity of the participants in the Rainbow Scrap Challenge. Please post a link to your scraphappy Saturday creations so others can stop by and see what you have been making. 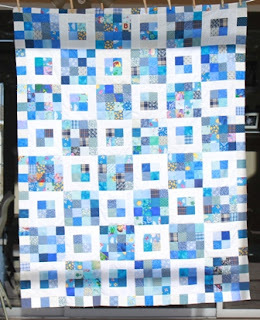 I know some of you are running out of blue scraps already. Congratulations! There are still two more Saturdays in January, I hope that will give everyone time to tie up the loose ends. Some people signed up for the Rainbow Challenge with the intention of using it as a block of the month. 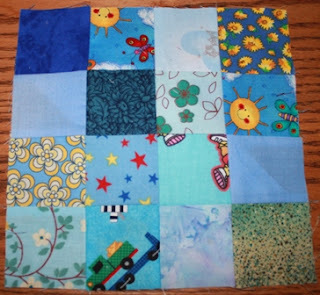 By collecting together 1-3 blocks each month you could create a stunning rainbow sampler by the end of the year. 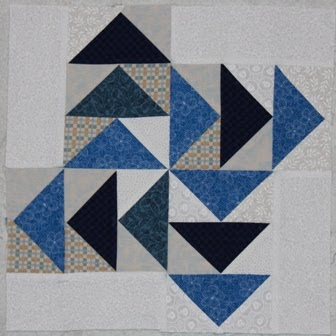 This block is called Pinwheel Geese and it uses the same flying geese units made from 2.5 inch strips that showed up in the star blocks last week. You will need 12 triangles cut with the companion angle ruler in blue and 24 triangles cut using the easy angle ruler in white. You will also need 4 rectangles that are 2.5 inches by 6.5 inches. I love it when you can cut a whole block from one size of strips. It makes life so much easier. 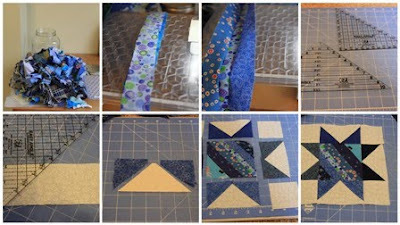 Assemble the triangles into 12 flying geese by sewing white triangles to each of the short ends of the blue triangles. The flying geese should each be 2.5 by 3.5 inches when they are done. 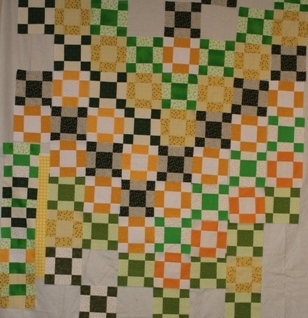 Each quadrant of the block takes 3 of the flying geese unit sewn together end to end. Press the seams away from the tips of the geese. Next sew a white rectangle to the left side of each subunit with the geese flying up. Each quadrant is sewn the same and then rotated to make the pinwheel in the middle. Press toward the white rectangle and assemble the block as shown in the photo. 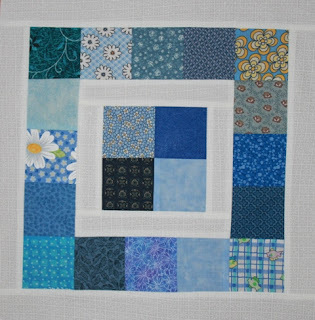 This block would be adorable with just the bottom goose in each block done in a contrasting color. I had a lot of string blocks that I was squaring up to 4.5 inches. Not sure that I wanted to turn them all into stars, I decided to try this simpler setting. When the string and crumb bits got to small to square up to 4.5 inches, I cut them to 2.5 inches and used those blocks as cornerstones. The sashing strips are cut 2.5 by 4.5 and give the blocks a little room to breath as well as separating the bulk of the seams for easier assembly. I am on the hunt for orphan blocks that I can square up to the same size to mix things up even more. See the little nine patch in the middle? I think I have some more of those somewhere leftover from a photo quilt that I made for my husbands grandmother who has since passed away. 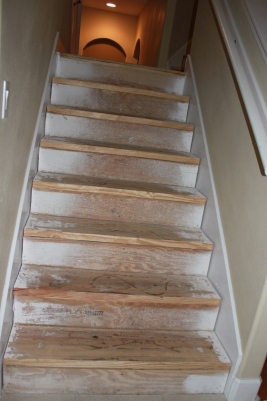 When we got new carpet, we decided not to carpet the stairs. 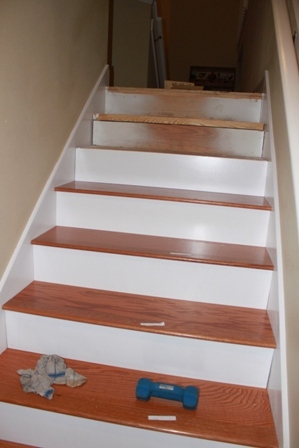 We pulled it all off in preparation for hardwoods. And so it sat, just like this, waiting for Kurt to return from all of his travels. Today was a off for him, and he finally had a chance to get started. I spent the afternoon painting the trim work and touching up the wall paint which was all full of tiny little hand prints. Now the house smells like fresh paint and cleaning stuff. Not a bad smell at all. Then this evening he got out the nail gun and adhesive and attached everything together. 6 stairs down, just 20 more to go. If you have left a comment asking to join the challenge and I have not responded, it is because your e-mail is coming us as no reply. I have added everyone to the linked list whom I am able to follow to a blog. Others have been placed on the no reply list. Thanks so much for everyone who is joining in. I hope you are all getting ready for the next scraphappy Saturday. Cerulean Blue is officially done after having the binding sewn down. I am officially done after having my husband out of town for three days. He is back now though, and I have a three day weekend coming up to recover from the busyness. 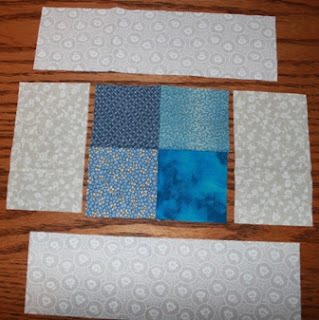 I spent the afternoon happily turning fabric scraps into Swiss cheese. There were a bunch of deconstructed shirts lurking in the bin with the usual scraps and several new GO dies still in wrappers. I focused on the blue of course, so you'll see more of these scraps soon enough. 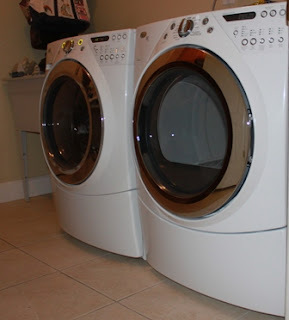 My goal is to have the laundry room cleared out in time for the new dryer to arrive. I am HOPING that we have a new dryer by time the weekend ends. Otherwise I'll start going door to door to borrow dryers. I've got two friends lined up who will be happy to lend me some dryer space in case we run out of underwear before the new appliances arrive. 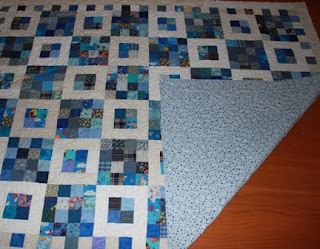 Sewing a bit on the binding for Cerulean Sky was as close as I came to something quilty today. With Kurt gone again I'm on both Mommy and Daddy detail. 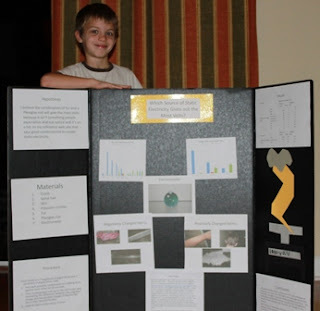 Science Fair projects are due this week so I spent some time after dinner helping Ryan finish off his board. Anna's is due on Friday, so I'll help her tomorrow. Everything is done for both, it just needs the final proof reading and printing so it can get glued down and turned in. Tuesday is always a meeting at work, so Sydney came with me to that while Anna did Art Club and Ryan did Lego Club. I went to help out with that as soon as my meeting was done. This weekend is the big competition so it is all about finishing up all the last minute details. I did have a little time for me amongst all the kids activities. I went out to lunch with my good friend Meisje and we got to catch up a bit. We used to run together every Saturday, but she had knee surgery and I got lazy busy, so now we have lunch instead. That little bit of calm is all that is keeping me going right now. The kids have just headed off to bed and I need to write a test and type up the Lego script before tomorrow. I've said it before, but I salute all the single parents out there who manage to handle all of this alone on a regular basis. It's been two days and I'm a bit batty already. I was over at Melinda Quilts and saw this amazing quilt that her guild made for donation. Each member was instructed to make a single color block. 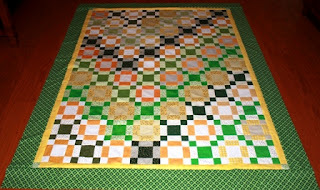 A similar rainbow quilt could be made my people who are making one or more blocks each month for the rainbow challenge. 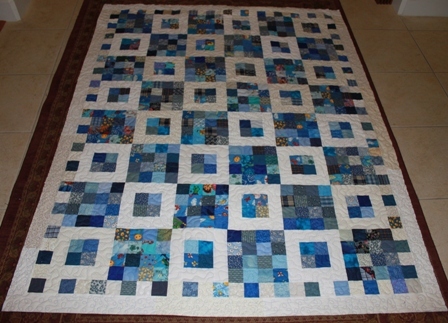 So far there have been a number of entire quilts and smaller projects produced. Next week I'll be presenting several 12.5 inch blocks in blue that could be combined with the other colors as the year goes on. 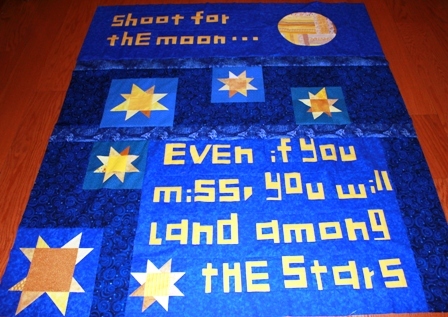 Go check out their quilt and see if it doesn't get your creative juices flowing. 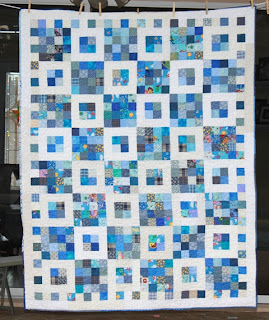 The design wall was still full of blue scrap projects, so I moved onto the floor with this blue scrap quilt that I decided to call Cerulean Sky. 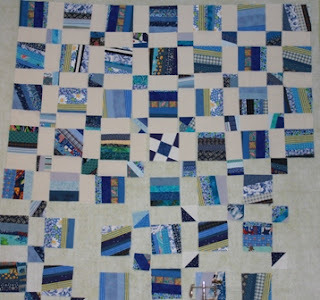 I used every single blue square from the 2.5 inch drawer and had to cut a few more to get it to a nice snuggle on the couch size. Make sure you head over to Judy's blog to see what everyone is working on. I just pulled Cerulean Sky off the frame. It is officially quilted. I tried floating it, which I've never done before. I think I like it all pinned on better. I wish I had used white thread instead of blue. I think the blue stands out too much, not that you can see it in the picture of course. The back is a super soft blue polka-dot flannel. I'm not sure if I'll go get the binding started now or or wait for tomorrow. I don't think I could get it done done tonight in any case. I might try doing the finishing by machine this time using one of the decorative stitches on my machine. I always do binding by hand, but I'd like to finish this quilt soon. The men went off to Legos this evening and Anna had a friend over to play, so I took all the girls out to the Chinese buffet. We saw a girl from Anna's glass and our next door neighbors while we were there. I love that. Anna's fortune told her not to tempt squirrels with nuts or she would get bitten. When we got home I discovered that the dryer had stopped blowing hot air. Kurt's work clothes had been spinning on cold the whole time we were gone. 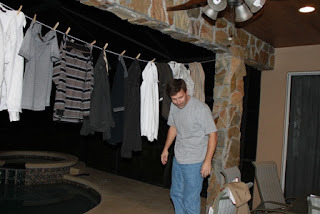 He goes out of town tomorrow and didn't know how he could get dry clothes. When I suggested that he hang them on the clothes line he was skeptical. He actually asked if I thought that would work. Maybe he has become a little too dependent on technology when he doubts the effectiveness air. I talked him into it eventually, but he is convinced it will never work and he'll be forced to take wet clothes to Denver. He really is a smart guy, but sometimes he makes me laugh. The top is put together for Cerulean Sky. I did the first border by sewing sections directly onto the blocks before they were sewn together. I just need to do a second border in white and then I can load it onto the frame. I don't know why I have such an aversion to borders. 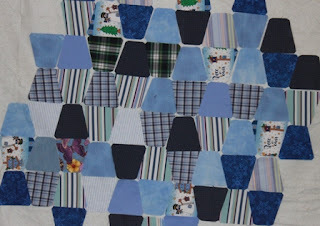 I went out after lunch and got some blue flannel for the back so it should be ready to go soon. Anna has a friend over to play and Ryan is working on his science fair project. Sydney has been in and out playing with kids from the neighborhood. I'm working on laundry and Kurt is cutting wood for the stairs. Just a regular old day around here. Hope you are all enjoying your Sunday. Today was ice skating for Anna at the same time as Girl Scouts for Sydney. That took the morning. Then after lunch there was an OM meeting which Kurt led, while I took Anna to Girl Scout rock climbing. 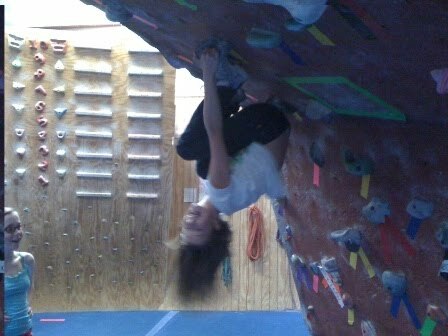 She and her friend Sierra spent a huge chunk of time hanging upside down when their arms were tired from climbing. Here is a Mister Linky box. Share your Scraphappy Saturday projects. Strings are among the humblest of scraps. Long skinny strips of fabric of random width get tossed into the bottom of scrap baskets and forgotten. With a little time and effort they can be turned into fabric again. That fabric can be pressed flat and cut into any shape. I wanted to turn my strings into stars using flying geese made from 2.5 inch strips. These geese are 4.5 inches long, so I squared my strings to squares of this size. I used my GO cutter, but before I had this nifty tool I used a simple square up ruler and it worked just fine. If you don't have strings (or don't save them), think about using 1.5 inch strips for this pattern. 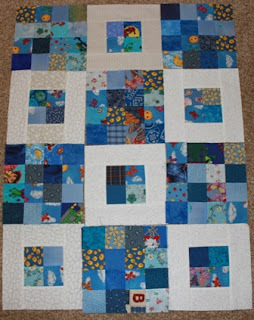 You could use 2 or 2.5 inch squares as well by just increasing the size of the square and the geese. I've seen similar stars done with postage stamps in the middle as well as crumbs or novelty prints. Step 1: Collect together all your blue strings. Don't they look like pretty blue spaghetti? Step 2: Choose 2 strings that are about the same length, make sure at least one edge of each is straight. 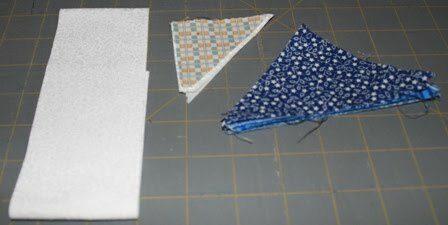 Place the straight edges right side together and sew using a standard seam. Step 3: Choose another string the same length or cut a longer string down to this size. Sew it onto the original strings, again with right sides together. Continue until your strings are about 6 inches in width. Step 4: Iron all the seams in the same direction and make sure your string fabric is nice and flat. 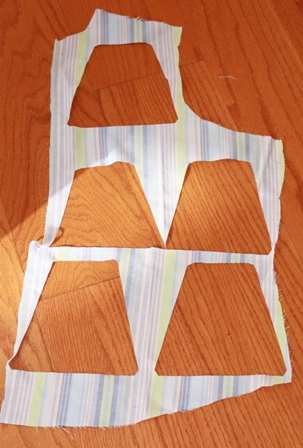 Step 5: Use a bias square ruler or similar tool to cut out squares that are 4.5 inches large. This can be done with the strings running from side to side or diagonal. Step 6: Prepare flying geese units using your favorite method. I chose a companion angle and easy angle ruler in order to cut both portions from 2.5 inch strips. 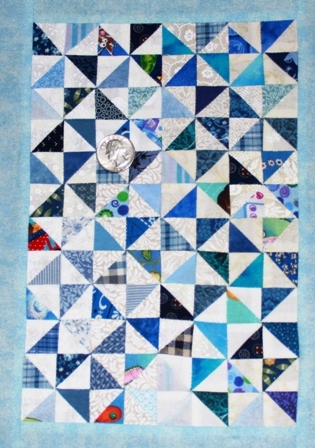 The white geese will form the background and the blue portions will serve as the star points. Step 7: Add 4 2.5 inch squares of background fabric and sew the subunits together as you would for a nine patch. Notice the orientation of the flying geese in the picture. The string fabric can be cut into any shape. I also made a diamond star using a different GO die. There were a lot of seams in the middle so next time I think I'll alternate strings with plain blocks so that they will lie flat. I think this is one of my all time favorite simple leaders and enders scrap patterns. I call it Four Squared because it uses a combination of 4 and 6 patch units. There is such a nice simplicity in square roots, isn't there? This isn't my original pattern, but I've seen it in so many places that I wouldn't even know who to give credit too for the pattern. 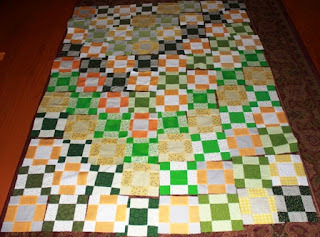 I paired up all of my 2.5 inch squares and worked them through to two patches. 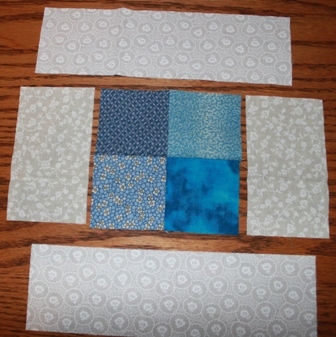 Then I paired those up to make four patches. LOTS and LOTS of 4 patches. 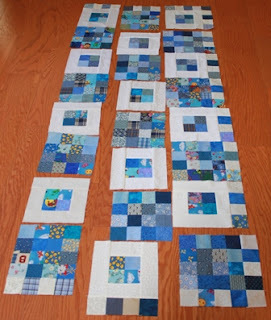 I used every single blue square I owned and then dug into strips to cut a few more. It felt good to get them sewn up. 24 of them got sashed with 2.5 inch white on white strips. The sides are cut to 4.5 and the top and bottom are cut to 8.5 inches. Those get sewn on and pressed toward the sashing. The remaining 96 of them got sewn together into groups of four to make 24 of these super cute 16 patches. I tried not to have the same fabric show up twice in a square, but it didn't always work out that way. The plan is to set these together 6 by 8 squares and add a simple border. I have in-laws visiting, so the sewing will have to wait for a bit. Still, I should be able to get the top done this weekend. Wish me luck.